Surprisingly, you can find three twins ice cream in a lot of cafes, Marin County, and even Whole Foods, but in there is only one Three Twins in the city. On the top is a scoop of chocolate orange, which tastes exactly like those chocolate orange candies that you crack open. You can't see it but the scoop under it is the lemon cookie, which has little bits of cookie mixed throughout into an exact replica (in ice cream form, of course) of a lemon cookie. After many years of wanting to check out Pal's Takeaway I finally made it out here. Its only open for lunch on the weekdays so its not as accessible for those who don't work in the city. I really wanted to try their ever so popular Aunt Malai's deep fried Lao sausage sandwich, but it wasn't on the menu today. Today's burger was the lamb burger. The soft, squishy bun worked really well with this burger, staying firmly intact through every bite. The meat, however, was a little dry and underseasoned. The deep fried cod sandwich was the better of the two sandwiches. I was a little worried that the fish wouldn't taste good because it had a slightly fishy smell, but the fish was perfectly cooked. The white fish had nice soft flakes and the batter was still crispy even though it was wrapped up in a sandwich. The chocolate babka is sold by the slice and really chocolately. One of the best things about going to a fancy restaurant is the bread service. Since I've eaten at Manresa (see post HERE), I'm fully aware of their delicious bread. Ever since I heard about their booth at both Campbell and Los Gatos farmer's markets, I thought that was the greatest idea since, well, sliced bread! You have to check their twitter for the exact time and specific farmers market, but everyone must have been fully aware of their schedule because a line formed before they opened at 9a. The breads menu changes and I highly suggest coming here at least 15 minutes before they open (9a) so you have a chance to get something before they run and they do run out things very quickly. One of the special breads of the day was bacon and onion focaccia. Giant chunks of thick cut bacon are sprinkled all over the surface of the focaccia. Even after biting into the fluffy focaccia, you can taste the bacon fat throughout each slice. Its probably the best of the bread haul. You can never go wrong with chocolate brioche. Crunchy pieces of sugar top this fluffy mini cupcake shaped loaf of brioche. Potato gouda foccacia. Thin slices of potato are spread amongst what looks like a generous heaping of gouda cheese. Since gouda is a strong cheese, its flavor really stands out, so if you aren't a fan of gouda, I'd probably stay away from this one. Brioche is loved for its buttery, fluffiness with just a hint of sweetness. This loaf is the pure definition of that. This one almost didn't make the cut, but a gal in line whispered "oh, that's a good one", so naturally it got added to the list. The chocolate cherry sourdough sounds like an odd combination, but it doesn't have the tang of regular sourdough rolls. The texture is very similar to sourdough with a dense, chewiness to it. Had I not known they were cherries, I would have mistaken thought raisins due to random chewy bits mixed into the bread. The bread is more of a dessert bread and I can see this enjoyed with a glass of cold milk. Top to bottom: sheepsmilk cheese epi, herb epi. I love epi breads so naturally I had to get both at Manresa Bread Project. The epi breads here are much chewier and the crust is quite soft. Both epi flavors come out quite strong in these breads. I prefer Acme's epi for their crunchier crust. With their new funding, Blue Bottle is slowly taking over the world (at least California). 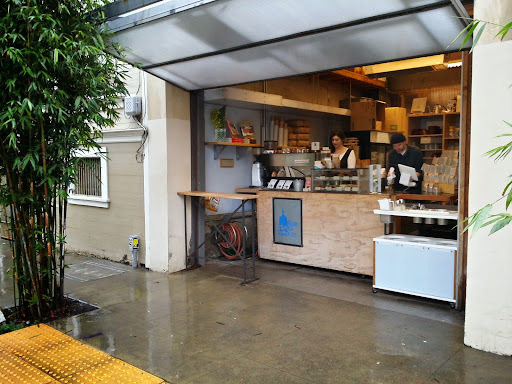 With its new location in Oakland, Blue Bottle has graced the East Bay not just with their coffee, but with some of their delicious liege waffle as well. 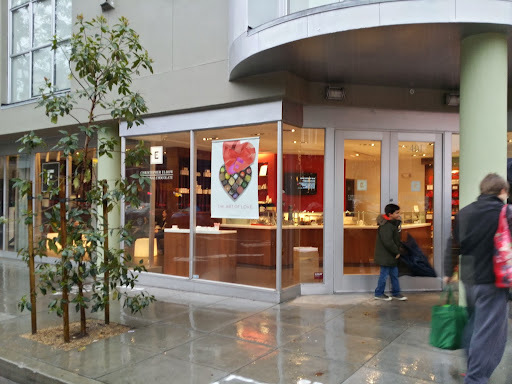 I've been hoping that with every new location, they would bring some of cooked brunch items I enjoy so much at their Mint Plaza location and finally, there is another location that serves this besides just that one. True to Blue Bottle's design, the space is large, open, and airy. One odd standout at this location is a large number of people with laptops, which is sort of rare to see at the other locations. 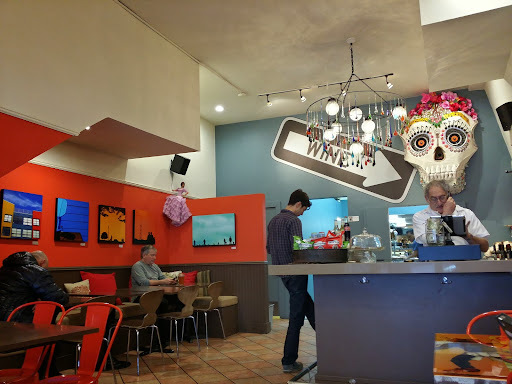 Besides the usual drip coffee, mochas, and New Orleans iced coffee, this location serves an oji style coffee, which is served black and with one ice cube. Simple, strong, and smooth. Another awesome thing about this location is they offer a flight of iced coffees so you can sample their New Orleans iced coffee, oja, and single origin in one shot, literally. As always, Blue Bottle mochas are beautifully done. Frothy, creamy with just the right amounts of mocha flavors. I'm a little dismayed that they don't serve the toast or the Belgian waffle here, but they do serve up the liege waffle, which is A okay in my book. Its pressed and made to order so you get the warm crispy edges with crunchy bits of sugar to enjoy with your coffee. Its tea time! Lisa's Tea Treasures is a tea room in the South Bay (Campbell). Like all other tea rooms, its very popular and its wise to call at least a week ahead for a reservations, however, I got super lucky and was able to get in same day. Like all other tea rooms, Lisa's was decorated to the brim with all sorts of knick knacks. Unlike most tea rooms I've been to, the lemon curd was already set on the table ready for consumption with their lovely tea biscuits. Tart, tangy, and creamy, this lemon curd is more on the sweet side than the lemony side. The tea biscuits are lovely set on the table for you to help yourself. Its just hard to try not to eat all of them while waiting for the mini sandwiches. One really unique thing I haven't seen at any other tea room before is they offer a monthly rotating menu with various seasonal goodies. I passed though in favor of their standard choices. Louis XIV's - from top left; clockwise: chicken croissant sandwiches, scone, and pecan tea sandwiches. The cheese puff in the middle of the plate was the best thing on the plate. All the sandwiches were much too sweet. My lady's respite. From top left; clockwise: egg salad, cucumber mint, roast beef with tomato and cream cheese, scone, chicken tarragon, and pesto nut. For tea time, my favorites are usually cucumber sandwiches and curry chicken, but they didn't have the latter or let you have an option. All the sandwiches were pretty average with the pesto nut being the best of the bunch. The mini quiche, although quite tasty, reminded very much of the mini frozen quiche from Costco. Desserts come with each of the tea sets. The chocolate mousse was surprisingly light and a delicious way to end the meal. The petit four, pecan tart, and yule log was one of the other dessert choices for the second tea set. I usually find petit four too sweet for my taste, but this one was quite scrumptious. Finally, Laotian food can be found outside of Oakland. Green Champa Garden, no relation to Champa Garden (see post HERE), lends a much needed variety of Asian food to the Fremont area. With a ton of Chinese and Indian restaurants in the Fremont area, I can definitely see this being a popular spot down the line. Nam kao (rice ball salad) is probably one of the more favorite and popular dishes of all Laotian cuisine. Its crispy texture of the rice along with the spicy and citrus flavors make this dish a unique winning combination for most people. I do prefer Champa Gardens and Vietiene's version of nam kao over Green Champa Garden, but if you've never had anything to compare to it, then this version can be quite good. One of the greatest things of Southeast Asian cuisine is their knack of creating well balanced combinations of spicy, citrus, and sweetness without any one flavor overpower the next. Larb is another one of my favorite Lao dishes. This one seemed to be missing some oomph and could have used a lot more spiciness. Not to mention the beef doesn't come out raw, but actually its ground beef. However, upon request they did bring out some housemade Thai chili sauce, nam prik pao, which I love and poured over everything. I could have been happy with just larb, papaya salad, and nam kao, but I figured I should have a go at a noodle or a curry dish. Noodles won out today. The drunken noodles was probably the weakest of all the dishes. The noodles stuck together in a clumpy mess and the flavor of the dish didn't stand out compared to the rest of the meal. I can't decide which I love more - nuoc mam (fish sauce) or nam prik pao (Thai chili sauce). If you ask, they will bring out their housemade nam prik pao, which I highly recommend. This makes everything delish and helps to up the spicy level to my liking. While I rarely order desserts at Asian restaurants, I have to say that the roti with ice cream was probably the best dish of the meal. Fluffy, buttery roti topped with vanilla ice cream that melted in a sweet sauce. So delicious. I'd come back just for this. 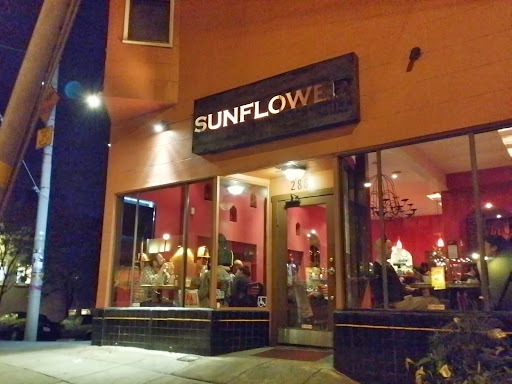 I've walked by the Sunflower in the Mission many times, but never really felt the need to go in. The absence of any Asian customers gave off Slanted Door vibes (high prices and lackluster food). I had almost given hope on any bun (vermicelli) in San Francisco, but I have to admit that this is one of the better versions of bun I've had. The prices aren't even that bad. At around $9 (which is actually cheap for SF), the portion size is really generous with a lot of noodles and meat plus two giant fried egg rolls. The lemongrass beef was well cooked giving the beef a tender and juicy flavor. The only gripes for me is the small portion of nuoc mam (fish sauce), which barely covers the surface of the heaping portion of vermicelli, and the vermicelli noodles cut into super small strands. That being said, I'd go back to get this one again, but ask for extra nuoc mam. The five spice chicken vermicelli is actually my usual vermicelli order when I eat bun, but while the chicken is well cooked and juicy, the flavor is bland and is probably one of the tasteless ones I've ever had. Usually my go to Vietnamese garlic noodles is PPQ, but I had to try Sunflower's version since it was one of their popular dishes. While it doesn't have a super garlic flavor like PPQ's, it is a lot less oily. Don't get fooled on the shrimp upsell like I did. The measly five shrimp was more of an afterthought and didn't add anything to the dish. The shrimp didn't even much garlic flavor. Valentine's Day is synonymous with chocolates. Christopher Elbow Artisanal Chocolates is not just a chocolate shop, but a small cafe that serves specialty hot chocolate. Hot chocolate choices range from peanut butter to coconut curry flavor. If you aren't feeling adventurous, they have a really good regular hot chocolate flavor as well. 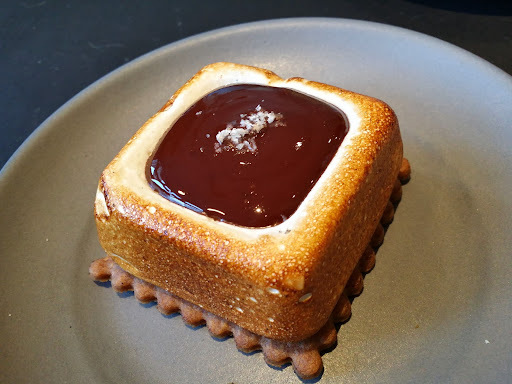 The deep chocolate flavor is made even more deletable with a homemade marshmallow. You can't walk into a chocolate shop and not get some chocolates. From top left; clockwise: maple bourbon, bananas foster, pear, and passion fruit caramel. My favorite from the bunch was the banana foster. If you can't wait till you get home to eat the chocolates, you can opt to sit in their seating area on the side of the shop. 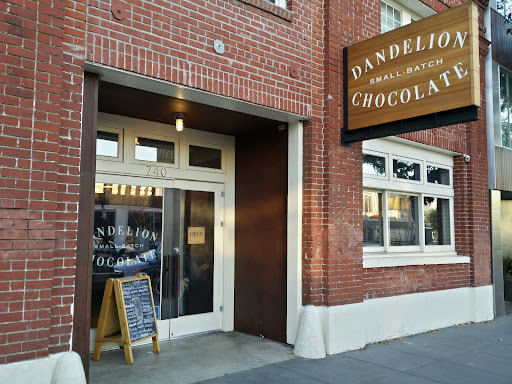 Before there was the Blue Bottle Oakland (see post HERE), Blue Bottle in Heath Ceramics (see post HERE), or any Blue Bottle for that matter, there was just this one. This humble abode, which is the size of a garage, is where it all began. I love coming to this one and sitting along the sidewalk to enjoy my usual pour over and having an occasional cookie. My usual pour over coffee. I remember when Blue Bottle coffee didn't have the emblem. Although people come to Blue Bottle for the coffee, they do serve up some really scrumptious ones. Especially if you like the soft chewy type cookies, like I do. The snickerdoodle is a popular favor here. This one has a really great soft baked texture. Chocolate is one of those flavors that pairs amazingly well with coffee and I'm pretty well known to enjoy a chocolate chip cookie with my coffee. 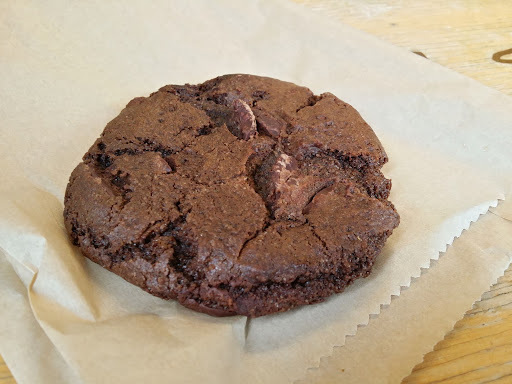 The double chocolate chip cookie has a good punch of chocolate without tasting like its too much (yes, I do think there is something as too much chocolate). 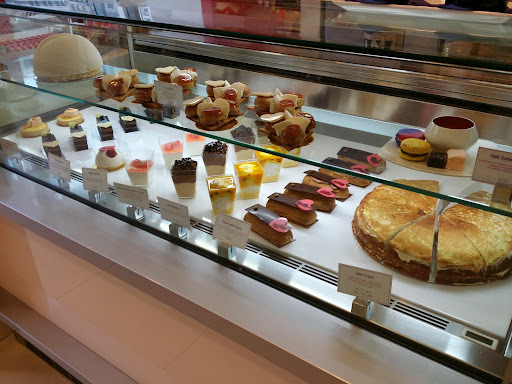 I've been meaning to check out Tout Sweet Patisserie, especially since I was a huge fan of Yigit Pura when he was on Top Chef. 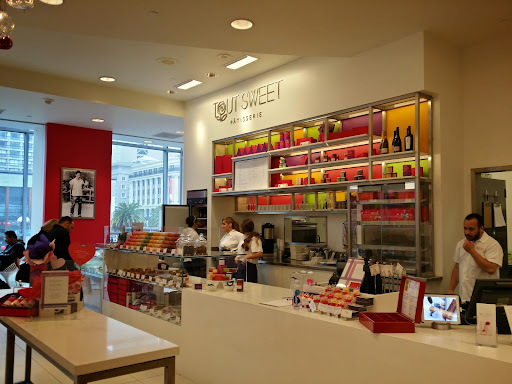 This sweet cafe is located on the 3rd Floor of Macy's. Don't get confused like I did and wander around in the basement food court looking for it. There are a lot of tempting sweets that I will definitely be back to try at another time. From top left; clockwise: Burnt caramel with sea salt, Aztec spicy chocolate, orange creamsicle, burnt caramel (repeat), dark chocolate. From top left; clockwise: Raspberry & Wu Long Rouge Tea, Tahitian vanilla, Earl Grey Tea Infused Dark Chocolate, Sicilian Pistachio & ceylon cinnamon.